The most common method of installing TPO membranes is through mechanical fastening. The membrane is mechanically fastened to the roof structure, which can consist of either wooden sheathing, trapezoidal sheets, or a concrete slab. The membrane is generally fastened through the thermal insulation, which requires special fasteners. Overlapping the membranes prevents the penetration of water into the installation. 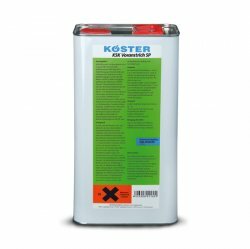 Due to its great compatibility with various materials such as bitumen, the KÖSTER TPO Membrane is suitable for use in the renovation of roof waterproofing systems as well. For instance, the KÖSTER TPO Membrane can be directly fastened to the substructure without having to remove the old waterproofing system as long as the substrate is intact and structural aspects do not indicate otherwise. Mechanical fastening allows for a quick installation and provides a high resistance to wind loads without placing an additional load upon the waterproofing system. Thus, the roof structure is comparatively light in weight. Furthermore, mechanical fastening guarantees that the membrane will not slip, even on pitched roofs. Mechanical fastening even makes a green roof on a pitched roof possible.